Anna Saidi draws water from a bore well in her village that was installed with funding from PWRDF and Global Affairs Canada. In Tanzania, PWRDF partner the Diocese of Masasi is entering the third year of the All Mothers and Children Count program. AMCC aims to improve maternal, newborn and child health, food security and nutrition and access to clean water. Underpinning all these goals is gender. Here are just some of the ways AMCC is making a world of difference in the lives of girls and women. Zainabu and her husband Shaban Nyenje have two sons and one daughter. They live in Mindu village. They used to have to walk two hours each way to a natural open pond to fetch water for domestic use, says Zainabu. “Though the water from the well in the pond area is clean, it is not potable or safe for human consumption. Outbreaks of waterborne diseases (cholera, schistosomiasis and other gastrointestinal problems) were common in our community.” Following the tradition, Zainabu’s daughter was the one who fetched the water, causing her to miss her morning subjects at school, for which teachers would punish her. So Zainabu would fetch the water. But there’s more. Mindu villagers now have access to safe water year-round and the outbreaks of waterborne diseases have diminished. With the long and arduous task of fetching water off the to-do list, women have time to operate profitable home vegetable gardens, breastfeed their babies and get to the health clinic for scheduled visits. 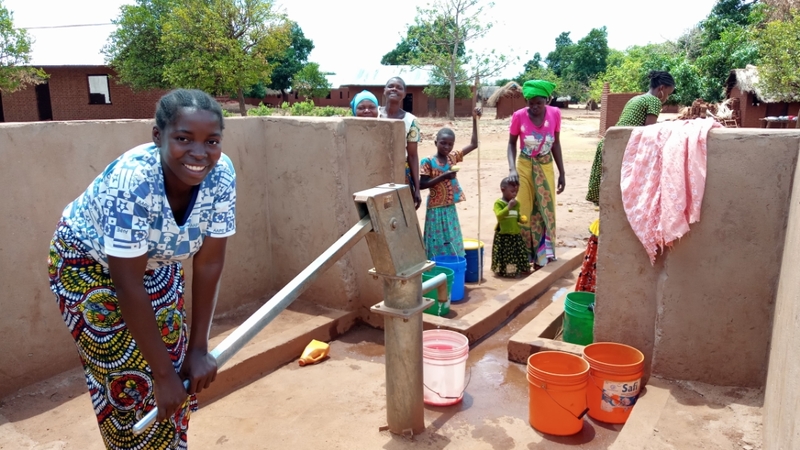 The borehole has also brought women together, giving them time to connect with each other through drawing the water from the well. Nurse Reheme K. Mgeni shows vaccines staying cool in the refrigerator of the health. For the area with two adjacent villages (Ngapa and Mnazimmoja) and a population of 3,837, providing health and medical services at night using kerosene lamp light is very worrisome. Without electricity, the clinic could not effectively cool vaccines. If a woman went into labour at night, their relatives or partner would have to bring their own kerosene lamp or flashlight to the clinic. Then AMCC installed solar panels to provide electricity. Now the refrigerator is running 24/7. “Delivery service at night is properly done with sufficient light and no more smoky oil lamps or faint-light torches used. Costs to purchase gas to run a refrigerator and transfer vaccines to a nearby health centre in Nakapanya (80 km return trip) have reduced tremendously,” says Ndunguru. At the Muungagno health centre, health care staff worked diligently and struggled to encourage community members, especially pregnant women, to use the delivery services. However, inadequate supplies and lack of services had discouraged men from allowing and accompanying their wives or partners to deliver there. Instead, they were transferred to the district hospital about 45 km away. But AMCC is changing that. Sofia Yazidu, a 33-year-old woman from Muungano village, was well into her third trimester of pregnancy of her fourth child in November 2017. 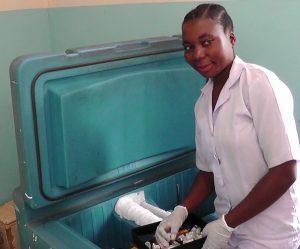 Sofia had heard about the AMCC Project providing support to Muungano health centre and the arrival of a new nurse midwife who provides health services and high quality care from a pregnant woman’s first antenatal visit through to her child’s vaccinations and beyond. “My husband was reluctant to attend health education meetings, even to hear about men accompanying their wives to health facilities,” says Sofia. Community Health Workers, SMPs, gender promoters and nutrition promoters organized education sessions for men and women on MNCH, the importance of accompanying pregnant women to the health facility and the new established approach for both partners to attend the first ANC visit. Her husband, Abdallah, had no excuse and he was obliged to accompany his wife Sofia to the clinic.